There's certainly a lot of new flavors being created over the past years, but no one's yet able to compete with creative vegan ice cream flavors. You get options like crazy peanut, NY cheesecake, blueberry lavender, or lemon buttermilk - all made without using any animal products. We sat down with Ferdinand, who's running Balaram Eis, and got to learn about how the shop came about and his life selling ice cream on a nice sunny Friday afternoon. Could you tell us about your background. How did you end up doing this job today? Ferdinand: I’m actually a musician and writer, and I’m originally from Stuggart, but my family travelled a lot so I lived in many places. I lived in the Netherlands for about 9 years, and I moved back to Germany because I missed the comfort of speaking my own language and Berlin seemed like the best option, due to its openness, where so many people move here to try their own thing. I’ve been living in Berlin for 9 years now, and I was working in music, but it was until about 14 months ago, right around when I met my business parter, did I think about trying something different. Running my own business is exciting and also a good challenge for me. Balaram Eis actually has a sister restaurant really close by. What's your relationship with the owner? F: It’s a interesting story actually, so me and my business partner Kristian met about one and a half years ago. He’s the guy running the sister restaurant Goura Pakora, just right around the corner, and I enjoy the food there a lot. One day, I wanted to go there, but it was closed, with a paper notice on the window that said there was a fire at the restaurant, and they would reopen soon. After seeing the sign still on the door after a year, I decided to write the guy an email asking when they will reopen, so I can enjoy the tasty dishes again. It turned out that he needed some further investment and a business partner to run the admin side of things, so I said I would do it. When we discussed more, he happened to just opened up this ice cream shop, so I went from being a loyal customer to his business partner, running the the restaurant and the ice cream shop together. There are so many people offering ice cream nowadays, but not a lot of them do vegan ice cream. What is your principle, having all your offerings vegan? F: Susanne makes the ice cream for our shop, and I’ve seen her working at the ice cream lab, so I know how much care she puts into the ice cream. She has a great technique of bringing out the flavor of the ingredients properly. For example, the apple sorbet is one of my favorites, and she makes the sorbet with local apples. I was so surprised when I tasted the actual flavor of the apple, when I’m used to the artificial flavor in those yogurts they sell at supermarkets. Besides, she’s constantly tweaking the recipes, coming up with new flavors, so the quality of the ice cream is always good. Now you’ve been doing this for a while now, what are some learnings you gained from running the shop? F: Balancing work life and personal life has been a particular challenge for me. It’s very difficult to disconnect with your own business, to not think about it 24/7. For example, if it’s a nice day and I’m going for a walk with my girlfriend, I don’t want to be talking about the business, but it happens automatically! It’s always in my head. Some people think it’s nice, like it’s the entrepreneurial life, but if you’re just thinking about your business, then you’re not paying enough attention to your friends, your family, and loved ones. At the end of the day, you definitely don’t want to be just a business machine. It must have been a hard task managing a job you own and you’re passionate about but also find time and space for personal life. Are there any other challenges you faced? F: Our cream machine actually has been quite difficult, and it’s not a joke. (Laughs) She’s called Rahmator, like a name for a superhero, and she makes whip cream for the ice cream shop. We like her and are very attached to her, but she always breaks down. Not sure if she has some psychological issues, but a lot of the times she would stop working all of a sudden. (Chuckles) But now I think we’ve finally fixed it! Having the shop right by Boxhagner Platz, there must be a lot of visits from people who are hanging in and around the park. What are your customers like? F: People who visit us are really nice, and it’s great to recognize their faces when they come back for more. There’s this guy who runs a restaurant around the corner, and he went through a phase last year which he came here 3 times everyday, 2 or 3 scoops a time. Knowing he loves yogurt ice cream, I’d have more yogurt ice cream in the shop for him. Besides, there’s another girl that comes in the shop a lot, and always asks so many questions about the ice cream, even when it was really busy. One day, I thought the only thing I could do to stop her from asking questions is to give her a job. We talked about it, and actually now she works here, which is perfect because she now knows everything about the ice cream, after asking all those questions! As a resident of Berlin for almost a decade, what are the characteristics of this city you’ve found that are different to the other places you’ve lived in? F: People often say this and I think it’s quite true: Berlin is a combination of different villages. You will find Friedrichshain, Prenzlauer Berg to be very different from Pankow, Stegliz, or Dahlem. Each area has its own character. Also, there’s certainly some tolerance in Berlin, which is good. It’s not really the kind of tolerance where everyone is welcomed all the time, but it feels like this grumpy tolerance, where you just let other people do their thing. You might not agree with what they’re doing, but you let them go on with their thing, and you mind your own business. It’s not necessarily a bad thing though. Berlin has this reputation of people being unfriendly, but once you get a chance to know someone, people are actually nice. 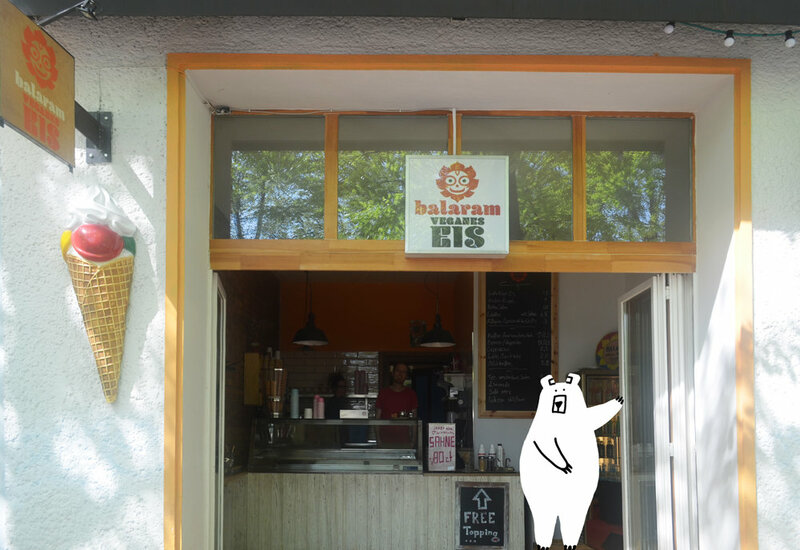 Ferdinand, running Balaram Eis and spreading joy in Friedrichshain. What’s an ice cream story you remember? F: I was visiting Bergen in Norway with my cousin when I was 16, and it was the first time we travelled by ourselves, for 6 weeks. We were young, didn’t have much money, but we agreed we would save up and eat a meal at a restaurant. Though it’s expensive in Norway, and our budget wasn’t enough to eat at the restaurant. Instead, we decided to buy 1 liter of ice cream each, and enjoy it just sitting on the streets under the sun. It was so much fun.